You have presumably used a form or two on the Web even if it is only to log in to social networking. They allow the user to send data to the Web server. You will learn how to handle the data on the server when you do PHP. 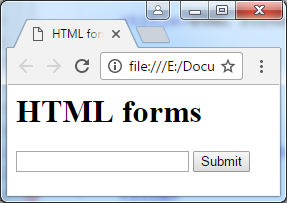 Create a new page (with just the usual elements) and save it as forms.html. If you try the button nothing much will happen because we have not told the browser what to do when the form is submitted. That comes later. The id attribute is used to pick one element out on a page. The for attribute tells the browser that this label is attached to the input with the matching id. Save and view. If you now click on the label the cursor should appear in the input field ready for you to type. If not you need to check the for and id attributes. Save and try the form by filling in some data and pressing the button. It will not work because there is one thing still missing. The reason the form is not working is that the data is being sent to the server but not properly. Any time you have a lump of data on a computer you need a way to identify that data. 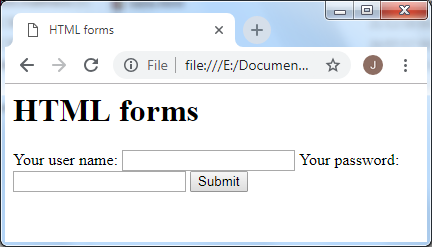 In forms you use name. Add a name attribute to your single text input field. Give it the same value as the id. That makes it easier to remember. Now it should work. The page which handles the data will just repeat it back to you and say you used post. To use a form you need a page on the server to accept the data and this one is there just to test forms. You will learn how to handle the data properly when you learn PHP. You should see both bits of data being displayed back to you. If not check your code. Note that the name does not need to be sensible (almost anything will do) but it is best to use names and IDs which mean something.